Two of my favorite books to use for mentor texts in teaching writing are: Love that Dog and Hate that Cat by Sharon Creech. Who, by the way, has written some beautiful children’s novels. (A)You understand your students’ brains. (B) You do not understand your students’ brains. This week, I had a few moments where I knew that my efforts, as a teacher, were not meaningless. I am working with a precious student who has writer’s block. The debilitating experience that renders the mind void of words. This phenomenon only happens when there is some writing assignment due immediately. She talked to me about her thoughts and feelings about writing. I was floored with her candor. I was also kicking myself for assuming that writing is easy. It isn’t always easy for me, so why would I think it would be for a ten-year old? Again, the humbling smack in the face of teaching knocked me into an educational wasteland. I had lent her the book, Love That Dog. I asked her what she thought of the book. I received a shoulder shrug. Of course, I asked again. She turned the book over and said, “This says it all”. So, of course, my eyes welled up-without my permission. Her eyes filled with tears. We stared at each other for a few seconds. I had nothing. Her brain was empty. How did it get that way? I love writing. I never thought I was particularly good at the craft. But, there are times the words on the page express my inner workings more than my incessant ramblings. I have retreated to writing when all other forms of communication failed me. In second grade, I was supposed to write a story about my summer. My summer sucked, so I made up a story. I put my brother on a raft, in women’s clothes, on the Chattahoochee River-never to be found. I remember standing in front of the class, making up the entire scenario. The ideas flooded my mind, and I couldn’t stop the madness. When my teacher realized that it was a fictional story, she reprimanded me and sent me to my seat. After that, I rarely spoke. Instead, I wrote. I have had dark times where writing was my enemy. The words were absent. My thoughts were cliché and I had nothing worth putting on paper. That is when I hate writing. Where do the words come from? How can my combination of words make any more meaning than someone else’s? I am writing this blog after spending uncountable hours writing essays for my reading class. There are nine. I have completed eight. Even Bon Iver and Cold Play couldn’t pull me from the depths literary Hades. I felt my eye twitch. I closed the door to my room. (Swift yet powerful move). I heard myself discussing fractions as if they were small children whom we were neglecting. So, I reviewed it all. I also gave out guilt candy. This blog is an attempt for me to come back to reality with my teaching. I have bad days with writing, but I value the craft. I am lucky to know some brilliant writers. I aspire to write something meaningful. But, I really just want the kids to enjoy extracting the words and images from their minds, and carefully placing them on the paper. Again, the lesson went in a direction that was not anticipated. I encouraged them to write my professor (profecr) letters. She wrote back. 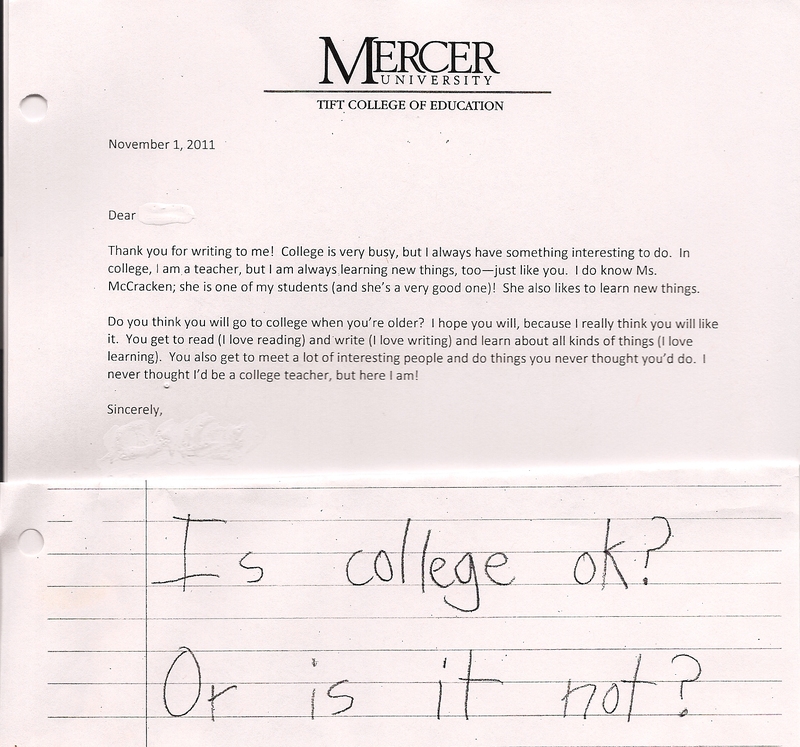 On college letterhead. With sketches of herself and pictures of her dog. My friend who helped me teach playwriting, to my 5th grade class last year, told the kids to write, I don’t know what to write about on their papers when they didn’t know what to write.” The freedom this gave them was amazing. It worked. I am continually reminded of the temperamental nature of writing. This strategy makes it o.k. to having nothing to write about. My reading class is over in a few weeks. My essays will be done. My odd poster project will be completed. Then I’ll sign up for more classes that will prepare me to be a better teacher. For now, no more peer-reviewed articles. No more essays. When my brain isn’t empty, I’m going to try to complete two personal writing projects. Or read a book. Or sit and stare at leaves. Maybe, I’ll just be thankful to know that, eventually -I will LOVE THAT WRITING again.